The Royal Cemetery of Ur received its name because of the large quantity of treasures that were discovered there during the excavations headed by Sir Charles Leonard Woolley between 1922 and 1934. Amongst other things, this treasure includes jewelry, weapons, musical instruments, as well as some curious artifacts. Although the treasures do not necessarily reflect the everyday life of ordinary ancient Mesopotamians, they do provide us with some insight into the luxuries enjoyed by the elite, as well as their view of the world. The Royal Cemetery of Ur is the name given to an archaeological site located in the ancient Mesopotamian city of Ur, in the modern day southern Iraqi governorate of Dhi Qar. Woolley’s campaign at Ur resulted in the discovery of about 2500 graves. Of these, 16 were considered to be ‘royal tombs’ on the basis of their exceptional wealth. Furthermore, two tombs, PG 789 and PG 800, were thought to belong to monarchs, the former to a king whose name is now lost, whilst the latter to a queen (though her actual social status has been a subject of debate) by the name of Puabi. Precious metals were undoubtedly found in great quantities in these ‘royal tombs’. A diverse range of artifacts from the tombs were created using gold and silver. For instance, the main material used to create the elaborate headdress of Puabi was made of gold. Gold, in the form of sheets, was also used to cover the wooden frames of some of the lyres found in the graves. Additionally, several of these lyres have the head of a bearded bull decorating its front, which is made by wrapping gold foil around a wooden base. In the case of the Bull’s Lyre, the whole head is made of gold. 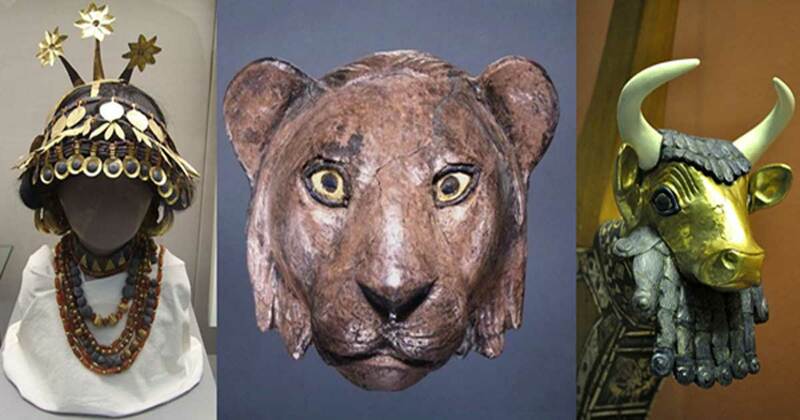 As for the use of silver, perhaps the best example is the so-called ‘Head of Lion’ or ‘lion of Ur’. A pair of these was discovered close to each other and Woolley speculated that they could have once been the finials for the arms of a chair. An assortment of vessels, weapons, and jewelry were also made using gold and silver. Apart from precious metals, many of the treasures from the royal cemetery of Ur have semi-precious stones in them. The most common of these is lapis lazuli, which had to be brought all the way from Afghanistan. The use of this stone can be seen, for instance, in the ‘Standard of Ur’, a rather curious object, the original function of which is still unclear. Woolley was of the opinion that this object was carried aloft during royal processions, hence its designation as a ‘standard’. The ‘Standard of Ur’ is also interesting for its decorations, which depict scenes of warfare on one side and victory celebrations on the other. These scenes are essentially mosaics that were created using pieces of lapis lazuli, red limestone, and cut shell. Finally, whilst not treasures per se, the funerary rituals performed at some of the graves may be regarded as a demonstration of the deceased’s wealth and social status. One of these rituals that has left physical remains is that of human sacrifice. 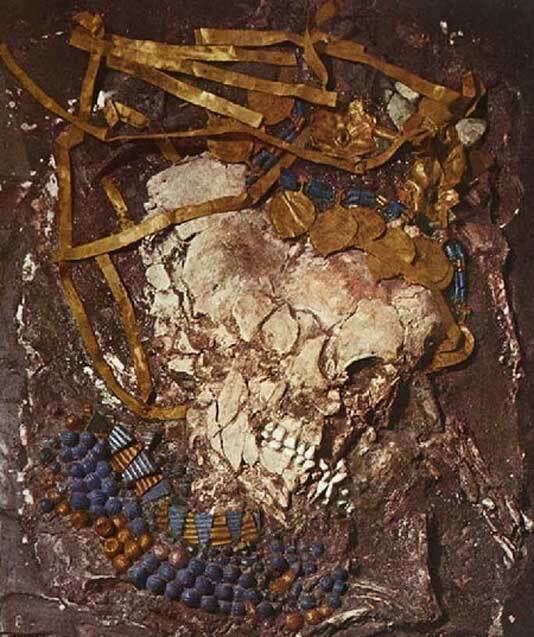 In the tomb of Puabi, for instance, the remains of sacrificed female attendants were found by archaeologists. Like Puabi, these attendants were richly adorned with jewelry and an elaborate headdress. Soldiers, identifiable by their copper helmets and spears, were also sacrificed. Furthermore, bullock cart drivers and the grooms of the animals were also found to have been victims of sacrifice. It has been suggested that these sacrificial victims were meant to accompany and serve the deceased in the afterlife. The control that some of those buried in the cemetery of Ur had over the life and death of others is certainly an indication of the high social status that they enjoyed whilst they were still alive.